Bring up “roots” in Memphis, and you could be referring to the blend of bluegrass and gospel music for which the region is famous. In this case, however, Roots Memphis is an urban farm incubator located literally just around the corner from Graceland, Elvis Presley’s stately former residence. The Roots operation is dedicated to sustainable agricultural practices, and now includes three farms (one at the original site, two at other locations nearby), an agricultural training program for young farmers, and a for-profit CSA open to the community. Mary Phillips is co-director, along with Wes Riddle. A former resident of Memphis, she returned in 2008 for a short time, not imagining that she would establish a home—much less a farm—in the city. “But I fell in love with the people here,” she says. Eventually, Phillips was asked by a community investor to develop an urban farm in the city. When she first visited the site Roots Memphis now occupies in the Whitehaven neighborhood, she says, it was an abandoned parking lot. Now the half-acre urban lot contains a hoop house, raised beds, a barn, and a composting area. The CSA currently has thirty members, but Phillips expects to see it expand. One regular Roots customer is St. Jude Children’s Research Hospital, where the chef’s mission is to get the healthiest food to children with already compromised immune systems. According to Phillips, the Whitehaven site was originally planned for food production, demonstration, and education. However, as Phillips and Riddle began to think about the city’s over-arching issues–poverty, brain drain and crime–they began to ask what it would take to activate these neglected neighborhoods with agricultural projects. Education seemed to be the answer. Phillips and Riddle spent a year developing an urban agricultural training program, which they launched in July 2013. 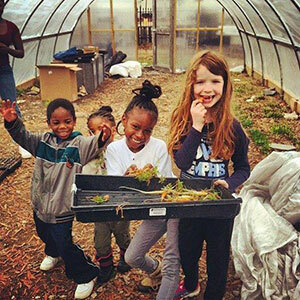 Many of the students enrolled with the Roots Memphis Farm Academy do not come from an agricultural background. Most are employed at other jobs, though they do receive some income through the CSA, which Phillips encourages them to use as a nest egg for future farm expenses. Phillips looks for particular characteristics in her apprentice farmers. “Farming is hard work, and it’s heartbreaking. Things go wrong all the time. We try to find the people who are going to look at an impossible task and not be overwhelmed,” she says. Students are given quarter-acre plots to work with, not only to learn how to grow crops, but how to effectively manage their farm businesses. Over the course of the non-profit two-year program, each of the students must create a business plan and meet his or her own benchmarks. Mary Phillips sees sustainable, profitable urban agriculture as the answer to the population’s flight from the core of “rust belt” cities like Memphis.